It was scary. That's why it took me so long to get started. I meant to start doing this a couple months ago. 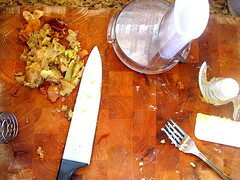 For one thing, I had never used a food processor before--Have you seen those blades? Secondly, I'm a little afraid of produce I buy at the store and wish I had my own garden. Third, foods considered safe for babies are different depending on who you talk to or what you read--this is actually the most frustrating part. The girls' pediatrician warned me not to give strawberries to Maxine, that babies shouldn't have strawberries until they're 12 months old, yet, look at the baby food at the store and you see "banana strawberry" or similar. Huh?!? And then I was looking at wholesomebabyfood.com and it said that carrots and spinach (two things I was going to puree today) have too many nitrates in them and babies shouldn't eat them until after a certain age. Maxine LOVES carrots from the jar! Why would Gerber put unsafe food in a jar for babies to eat? I have decided I don't fully trust this neurotic site but will look around for more conclusive information about their claims before I mash up my carrots and spinach. 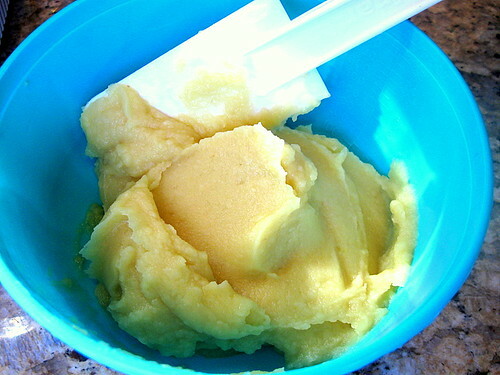 Today I made two batches of baby food: peaches and sweet potatoes. I used only one peach and one pretty big sweet tater. I steamed the peach and baked the tater. After pureeing the sweet potato, it looked and tasted so good (that little tiny bit I got on my finger) that I wished I had bought more so I could have my own all mashed up like velvet! It was very starchy so I added to the processor a little of the cooled boiled peach water. I'm very happy with how it came out. The peach didn't come out like velvet but it doesn't have the starch that the potato has and I figure that has a lot to do with the resulting texture. I spooned both foods into one ice cube tray which I filled completely. After the cubes freeze they will be popped into freezer bags and stored. Maxine has been in a bad mood since last night. I have a feeling more teeth are coming in. It is so tiring trying to cheer her up and more difficult when Raquel is testing my patience at the same time. I have mommy burnout today for sure. Yummy! My mom made baby food for us until I was about 5 LOL! Only because I remembered the flavor from when I was a toddler and would ask for it. I hear ya with the neurotic websites. I've found a few of them, while researching information. I don't have one of those teethers that you put in the fridge, so sometimes I grab an ice cube and hold it on her gums with a napkin. This works for a minute, usually because she's interested in what it is. I just gave her a bath and she seems a lot happier now. Somedays, like today, I can't wait for both kids to go ni-night. You are doing an amazing job - look at this food! Maxine is going to end up a chef. http://www.babyfood101.com - I hope this is helpful. The nitrate thing is a little nuts - my pediatrician said to wait until 8 months old before feeding homemade. Thanks. I'm gonna visit your site today after a playdate! Look at you! You're such a rock star! I had all these grand plans of making Maggie's baby food. After spending several hours for several days doing the same thing you did, Maggie spit everything I made out. As a former chef, I completely took it personally. I'm so jealous that Maxine ate it all. I got frustrated and gave up too soon. Now, I've got a toddler who is getting a little picky. She always loved avocados. Avocados are great! Good fat and 12 grams of fiber per avocado. I would sure notice when Maggie missed a day of avocado. She'd be all stopped up. My ped told me the same thing about the carrots but she said the stuff in the jars should be ok because the baby food industry is so regulated. I know I'm plain LUCKY in the kid-doesn't-spit-the-food-out department. Hi there! 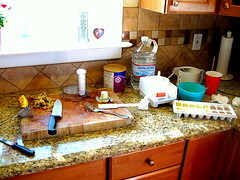 Maggie from wholesomebabyfood.com :-) I was told about your "neurotic website" thoughts and I just wanted to comment. As we mention on our site, "It is important to note that the odds of your baby getting "Blue Baby Syndrome" nitrate poisoning from Carrots or other veggies is about 0%." You see, we are constantly out there letting people know that nitrates are NOT, NOT, the horrific risk that many sites (mostly with commercial baby food affiliations) will tell you they are. The nitrate issue is one that has many parents turning to commercial rather than homemade. Many baby food companies make claims that their foods are risk free of nitrates while homemade is a big risk, in an effort to turn parents away from homemade. If you have the time, I would love to learn why you felt our article indicated that nitrates were/are a health risk and why you "have decided I don't fully trust this neurotic site". We believe we have finally written a page that addressed the nitrate issue with clear science, AAP recommendations and facts to let parents know that there is NO huge risk. Hi, Maggie. Thanks for stopping by! I can't remember the exact verbiage of what I read on your site that day. It must've given me the impression that carrots and spinach were risky for babies which added to my frustration over conflicting information from all kinds of baby experts, books, sites and doctors. I admit to jumping to conclusions about wholesomebabyfood.com--I didn't read the entire site or your nitrate article. I must have missed the part about "It is important to note that the odds of your baby getting "Blue Baby Syndrome" nitrate poisoning from Carrots or other veggies is about 0%." That alleviates a lot of fear and frustration! Maybe a girl like me needs that kinda info in big bold print. I apologize for the name-calling ("neurotic") and any fall-out my comment may have caused. Thank you for clearing things up. No need for apologies whatsoever, tho I do appreciate your thoughtfulness! "It is important to note that the odds of your baby getting "Blue Baby Syndrome" nitrate poisoning from Carrots or other veggies is about 0%." up even further so it's one of the first few things people read. 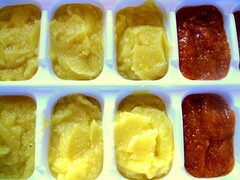 The whole nitrate issue gives us immense frustration; it seems to be a (fear) ploy on the part of commercial baby food companies to discourage Moms from homemade baby food! Of all the pages found on our site, we want this one to be the most "comforting" - that sounds a bit off but I can't think of another proper word! Thanks very much for making it clear what we might do to make the page better at easing the fears!